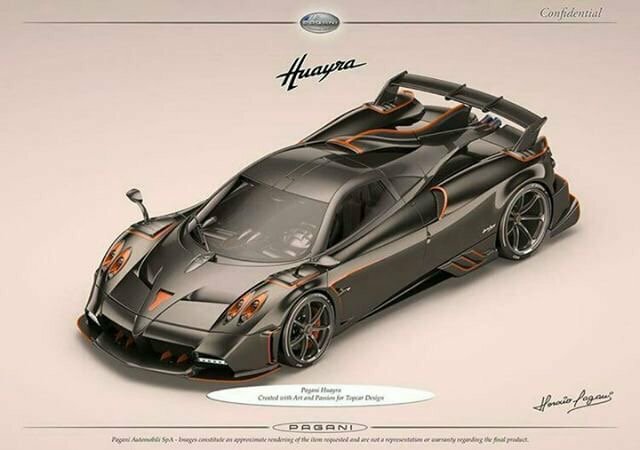 The Pagani Huayra hypercar range will soon expand to incorporate a new extreme edition called “Dragon” – and the production is already underway, the manufacturer states. A grand total of five vehicles will be produced against a custom order of Russian tuner TopCar Design. Compared to the standard-issue model, the super-exclusive Huayra Dragon features a different aerodynamic kit, including a fixed rear wing made of carbon, a huge rear diffuser, and an air scoop with a fin on top. The front and rear fenders, as well as the side skirts, will sport narrow-slit air intake louvers. The extreme edition will also boast certain color accents throughout the body. The technical specs will most likely stay the same, meaning that the hypercar will ship with a seven-speed DCT transmission mated to a 6.0-liter twin-turbo V12 engine rated at 800 hp (596 kW). Powered by the same engine, the Huayra BC sprints 0-100 km/h (0-62 mph) in 2.7 seconds. Pagani Automobili issued a Huayra roadster series last summer, named Gyrfalcon after one of the fastest-flying birds of prey in the falcon family.